Soulbury Three Locks Moorings (Below Locks) is a place on the waterways minor waterways place place on the waterways major waterways place village town city on the Grand Union Canal (Grand Junction Canal - Main Line - Gayton to Brentford) between Willowbridge Bridge No 99 (2 miles and 2½ furlongs and 1 lock to the north) and Marsworth Junction (Junction of Grand Union Aylesbury Arm with Main Line) (12 miles and 1¾ furlongs and 15 locks to the south). The nearest place in the direction of Willowbridge Bridge No 99 is Stoke Hammond Bridge No 106 (Stoke Hammond half a mile to the west); 4¾ furlongs away. 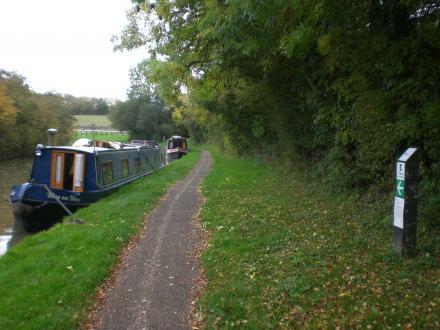 The nearest place in the direction of Marsworth Junction is Soulbury Bottom Lock No 24; ¾ furlongs away. Leighton Buzzard — 923 yards to the southeast. Leighton Road, Milton Keynes, MK17 9 — 1149 yards to the northwest. Leighton Buzzard — 175 yards to the southeast. Ridge farm Dean farm Lane Soulbury, Leighton Buzzard, LU7 0DE — 1012 yards to the southwest. The Three Locks Golf Club, Great Brickhill, Milton Keynes, Buckinghamshire, Milton Keynes, MK17 9BH — 713 yards to the northeast. Great Brickhill, Milton Keynes, MK17 9BH — 409 yards to the northeast. 3 Mount Pleasant, Milton Keynes, MK17 9EX — 1032 yards to the northwest. Soulbury — 1637 yards to the southwest. 42 Manor Close, Stoke Hammond, Milton Keynes, MK17 9DJ — 1194 yards to the northwest. Hillersdon Chase, Stoke Hammond, MK17 9DH — 1604 yards to the northwest. Stoke Hammond — 1390 yards to the northwest. Soulbury, Leighton Buzzard, LU70DE — 1294 yards to the southwest. Leighton Road Stoke Hammond, Milton Keynes, MK17 9DD — 495 yards to the northwest. Stoke Hammond, Milton Keynes, MK179DB — 1096 yards to the northwest. Soulbury, Leighton Buzzard, LU7 — 1637 yards to the southwest. MD Autocare, Workshop Olde Bell Close, Stoke Hammond, Milton Keynes, MK17 9BZ — 1280 yards to the northwest. Partridge Hill, Great Brickhill, MK17 9BH — 449 yards to the southeast. Leighton Road, Stoke Hammond, MK17 9BB — 764 yards to the west. Milton Keynes — 1117 yards to the northwest. Swan Cottage, Church Road, Stoke Hammond, MK17 9BP — 1623 yards to the northwest. Fenny road, Stoke Hammond, MK17 9BT — 1546 yards to the northwest. Leighton Buzzard — 1518 yards to the east. Stoke Hammond, Milton Keynes, MK17 — 1482 yards to the northwest. Bragenham Side, Stoke Hammond, MK17 9DB — 1102 yards to the northwest. Bragenham Side, Stoke Hammond, MK17 9DB — 1091 yards to the northwest. Hillersdon Chase, Milton Keynes, MK17 9DH — 1563 yards to the northwest. 1440 yards to the southeast.